LP (UK, etc.) Holland LP Germany LP Portugal LP Zimbabwe LP (unknown) LP UK, Eur-WEA, Fra, Jpn-Tok, Jpn93, Jpn95 cd USA, Can, Aus, Jpn90 cd 10" vinyl reissue UK, Europe-WEA, France cassette USA cassette Canada cassette Japan cassette Italy cassette Greece cassette Australia, New Zealand cassette Australia-Festival cassette LP inner sleeve inside UK cd 1 inside UK cd 2 inside UK cassette UK LP back UK cd back USA cd back USA sampler 12"
The original version features the Rough Trade logo in cursive letters. 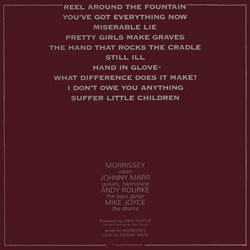 The labels are grey with blood red text, and the credits below the song titles appear as "words: Morrissey - music: Marr". Same label colours, but the logo changed to the rubber stamp variation. The credits now appear as "Morrissey and Marr". Same layout as previous version but the colour of the labels now changed to blue. This seems to be the scarcest of all three variations. Some copies, perhaps the earlier ones, have a grey round sticker on the front of the sleeve enticing potential buyers with the content. Variations on which the band's name on the front appears in a different colour have been reported. These will not be treated as 'official' versions as the colour variation may be a consequence of colour imbalance at the printers and not a deliberate decision or a standard mix-up. One such item has the name of the band on the front in aqua green. The text on the back of the sleeve is also more green. The rest of the packaging corresponds to version 1 above, so this means paper inner sleeve (in colours also slightly off), grey labels and cursive logo. The pink vinyl, blue vinyl, yellow vinyl, red vinyl and clear vinyl LP editions on Rough Trade or Rough Trade/Transmedia are actually bootleg reproductions made in 2006, 2007 or 2009. The front of the 2009 Rhino LP reissue is the same as the original Rough Trade LP, with the band's name appearing in grey. The back is almost the same, with the exception of the credit 'Distributed Through Ten' and the presence of a bar code. The inner sleeve and labels are also replicated faithfully, with the only alteration being the correction of the catalogue number to ROURH 61. The package includes a coupon with an offer to download the album on MP3 format. This is actually advertised on a white square "Vinyl Plus+" sticker on the front. This was not offered with the American 2009 edition detailed below. The Rough Trade logo on the spine and the cassette is always the rubber-stamp variation. Given the situation with the LP format (see above), copies with a cursive logo would be expected, but none as ever been reported. Please write if you own a copy. The cover artwork of the original Rough Trade cd is the same one that was used for the LP format, with a relatively big compact disc logo added in the top left corner. The back artwork is a variation on the LP's, with added compact disc logo and barcode. One difference with any version of the LP format is that the publishers are listed here as Warner Bros. 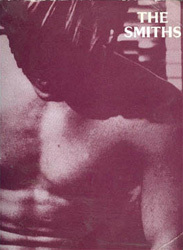 The booklet features a photo of the Smiths by Eric Watson which was not found on other formats. This photo had previously appeared on the insert slipped inside the Japanese "This Charming Man" 12"s. The individual band member photos are found in black and white at the back of the booklet, instead of in red as on the LP's inner sleeve and on the cassette's insert. There are two versions of the cd. Both have plain black text with the same layout. The differences appear in the credits circling the outer edge of the compact disc and around its center. One was manufactured in France by MPO, just like many other early Rough Trade cds, while the other is credited as 'Made In England' and 'mastered by Nimbus'. 52-page softback book featuring sheet music, chord diagrams and lyrics of all 10 songs from the album plus "This Charming Man", complete with discography and pictures. View here. - a 1-sided sheet with the black and white album art reproduction as above, but with track listing underneath. Some of the white sleeves promos had the latter one-sided sheet affixed to the front. Other scarcer promo LPs which may have served a slightly different promotional purpose have a Scott Piering sticker and photocopies of the labels glued to the sleeve. The album was also promoted with the help a radio-only single featuring two songs from the album: "Still Ill" on the a-side, and "You've Got Everything Now" on the flip. Unlike many other Smiths promos of that format, special care was taken in this one's design. The labels feature a tall pink 'A' across them, obviously inspired by Morrissey's beloved singles from the 1960s. The record comes in a plain black paper die-cut record bag. Most copies were paired with a press release from Scott Piering, but most of these have since been lost. Some copies have a small sticker on the sleeve giving the contact information of a plugger, presumably Scott Piering. A few copies of the 7" test pressing described below were salvaged by serving very early and limited promotional purposes. Their yellow-green labels were stamped with the side letter inside a circle. They were distributed inside a black paper record bag with photocopies of the labels glued to respective sides. A Scott Piering plugger sticker was also affixed to the side featuring the photocopy of the a-side label. It appears that this may have also been distributed with the postcard described below stamped with plugger Scott Piering's contact information. This slightly bigger variation shows the artwork in a different tint and some of the text in a different colour. View here. This is very likely a bootleg reproduction. This differently proportioned variation is similar to the two above, but it has its own text layout. View here. 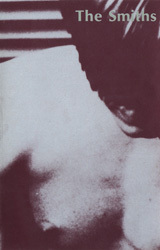 This item shows the usual album front artwork cropped to fit the postcard's portrait shape (view). The rear has brief details about the release with plugger and Rough Trade contact information. A yellow-green label test pressing of the above promo 7" has made it into the hands of a few lucky collectors. A few copies of this were used for very early promotion (see above). A one-sided test pressing of side B has also made it out to the collector's market (information needed). A white label test pressing has been seen for sale in 2010, but the legitimacy of this item is in doubt. The test pressing of the 2009 reissue on 180g LP is slipped inside a plain white die-cut sleeve. It has plain white labels and the number 971332 is etched between the run-out grooves. Acetate of a-side and b-side. Info needed. Copymasters advance cassette. Info needed. A proof of the original Rough Trade LP's inner sleeve has made it into the hands of a collector. The grey on the picture side is darker and the paper is thicker than the final release. Official BPI gold sales award disc issued to commemorate sales in excess of 100 000 copies of the album. It features a gold LP mounted on a red background above a gold engraved dedication plaque (presented to Morrissey, presented to Andy Rourke, etc) and cassette artwork card, with mini Union Jack flag in the top left corner. Approximately 20" x 16" framed and glazed. Over the years, three different labels were successively granted the licensing rights to release Smiths material in Australia. The original 1984 to 1988 releases were licensed to CBS. 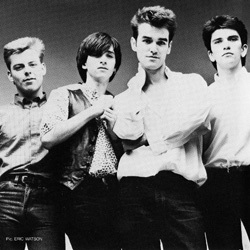 In 1988 Festival Records re-released the complete Smiths' album catalogue, as well as some or their singles. Finally in 1993 Warner Australia followed WEA's international reissue programme and all the albums ended up being re-released in Australia on cd again. The sleeve of the original 1984 CBS LP is very similar to the British one, with a few minor alterations made to the credits found on the back. The name of the band on the front is of a very dark green and the titles on the back are light green. The inner sleeve also follows the British layout and quality. It is made of thick paper and features pictures and credits on one side and lyrics on the other, in maroon over grey (although lyrics to the bonus track are missing). The labels are in the same beige and brown colours first used for the "This Charming Man" single, and feature the 'shattered' Rough Trade logo. The 1988 reissue on Festival Records is not as nice as the original LP. The sleeve is similar to the original pressing, with minor changes accounting for the different label involved. The band name on the front is grey instead of the original LP edition's greenish-grey. The record features red labels with black text and a Rough Trade circle logo at the top. It is slipped inside a plain film inner sleeve instead of the usual picture one. The package also includes a paper insert advertising "The Smiths' Collection". The original Australian cassette shows the usual LP artwork on the front, over a pale blue background (view left). The name of the band is repeated in brown at the top while black Dolby and Rough Trade logos are found at the bottom. 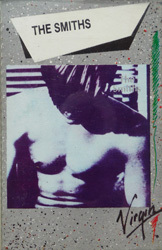 The spine is white with "The Smiths" in the middle in big bold red letters, the catalogue number in pink on the left (above a Dolby logo) and a black 'shattered' Rough Trade logo on the right. The back flap features only the track listing and a block of Rough Trade credits in black over white. The track listing is repeated on the reverse of the insert, again in black and white, above a production credit and a block of fine print about copyright and Dolby noise reduction. The insert does not have any extra fold-out panel (if your copy has one, see New Zealand cassette below). The cassette itself is made of clear plastic with black background to make the white text more visible. The track listing appears at the top, with a 'shattered' Rough Trade logo and the catalogue number on the left. The front of Festival's cassette reissue features the LP artwork over greyish blue background, with band name and Rough Trade logo in black at the top, and a Dolby Stereo logo at the bottom. Information about insert and cassette are needed. It appears that there may not have been a cd version of the Smiths' debut album released in Australia before the 1988 Festival reissue. This would mean that the band's debut is the only album to not have been made available domestically there on compact disc until Festival acquired the licensing rights. The Australian cd on Festival Records looks even more like a bootleg that its vinyl counterpart. The cover photo is grainy like a bad scan. There is no booklet inside the case, just a folded insert without any lyric or photo. Minimal credits are given in the dullest font. The back is blue with song titles and credits in plain black text. The cd's top surface has plain black text only and the name of the band appears in the "Strangeways Here We Come" album font. Two variations of this items have been found. In both cases the packaging is identical to the European counterpart described below. The only differences are found on the disc. The first disc variation is purplish red, a similar tone to the European disc, but there is no catalogue number at the top, the "Made In Germany" line was removed, the label code on the left was replaced with Warner Music Australia credits and logo, and the credits around the bottom outer edge are black and adapted to Warner Music Australia. The second variation appeared later on the market. The disc surface is black, the Warner Music Australia credits and logo on the left were removed and the credits around the bottom edge are silver instead of black. The original release of the album was promoted with a version of the LP featuring the typical Australian black and white silhouette labels with promo warning. The rest of the packaging is identical to the stock release, as nothing marks this as a promo besides the labels. A very limited number of copies of the Festival stock LP with promo sticker on label were distributed to promote Festival's reissue programme. The most surprising thing about the Brazil LP has to be its unique inner sleeve, which is made of card just as thick as the outer sleeve. Its design is the same as in the UK, but in different colours. The picture side is tinted purple-red instead of grey, and the band member photos are in black and white. On the other side the lyrics are printed in black over the same dark maroon, which makes them very difficult to decipher. The outer sleeve also has its own colour variations. The name of the band on the front varies from tan on some copies to very dark brown on others. The text on the back is tan. The layout is as in the UK, with minor local variations, including the presence of the catalogue number in very small print in the top right corner on the front. The labels are red with black text, including a 1987 copyright which may be a typo. 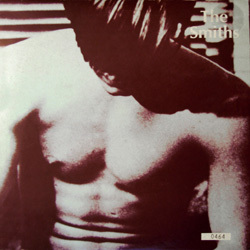 "This Charming Man" is included in the track listing on the back, but not on the record's label, and the song is not featured on the album. The existence of this item is suspected, but unconfirmed. Brazil is one of the countries that followed WEA Europe on its reissue programme of 1993 and this album was made available there on compact disc that year for the first time otherwise than on import. The packaging and content are based on the European edition described below. The only difference is found in the licensing credits. Promo copies of the LP are stock ones stamped "Especial para promoçao invendavel amostra gratis tributada" in gold letters on the back. Sire in Canada followed closely in the steps of Sire in the USA and this item is very similar to its American counterpart. "This Charming Man" was added as a bonus track at the beginning of side 2 and the band name on the front of the LP was given an edge for more emphasis, just like in the USA. The text on the back of the sleeve is darker than in the UK and there is a maple leaf in the top left corner. The inner sleeve is identical to the British one, but in black and white paper, which mean the photos on one side are all black and white and the credits are in white instead of maroon. On the other side the lyrics are printed in black on grey. 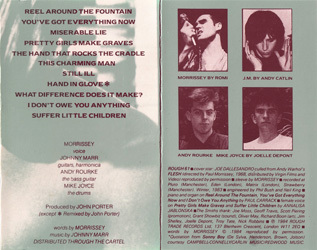 The lyrics to bonus track "This Charming Man" are squeezed in at the bottom under the other lyrics, as on the American edition's inner sleeve. Some copies of the LP were pressed with the front cover in a much darker tint. "The Smiths" in the usual Sire font; Rough Trade logo is not as tall as on first version; credits around the edge of the labels are black; "Miserable Lie" is listed as track 2. Same as previous, but credits around the labels are orange, and at a greater distance from the edge. The cassette insert features the LP's artwork at the top with the leftover space underneath used to display the logos of the various labels involved, in white over black. The spine and back are black with white text. The back of the insert is full, it features the track listing and two holes for the case's plastic prongs. The cassette itself is made of black plastic and the text is printed on it in grey. The Canadian cd is very plainly done and hasn't changed since the first pressing. The front and back artwork are the expected ones, the back featuring the usual text in grey over maroon background. The booklet includes the lyrics and band member photos in black and white. The back of the booklet features instructions on how to handle and store compact discs, typical of late 1980s, early 1990 cds. The top surface of the cd has plain black text with band name on top and track listing on the right. Promotion of the Smiths' debut album in Canada was done via stock copies of the LP stamped in gold ink on the sleeve. While the stamp is found on the front of the sleeve in the USA, it is always on the back for Canadian releases. The Canadian promo stamp also has the particularity of being bilingual, the promo warning appears in both English and French, the country's two official languages. The promo record's labels are like those of the first version described above. 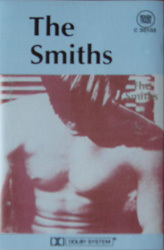 A various artists promo cassette titled "Internationally Yours" (WEA IYC1984) was sent to radio at the time the Smiths' debut album was released. It features "This Charming Man". A promo 7" of "What Difference Does It Make?" served to promote this album as much as that single. Details are found in the collectors appendix of the "What Difference Does It Make?" single. 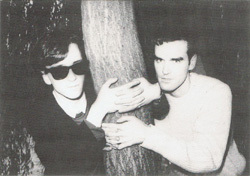 After purchasing the rights to the Smiths catalogue, Warner released two best ofs then in 1993 proceeded with the reissue of all the albums over the territories they controlled. Their 'international' edition was "made by WEA in Germany manufacturing Europe" as the credits state and was sold mostly in Europe, and in some Latin American countries. The design of the various formats was based partly on the original British and American designs. The WEA cds and cassettes were reissued again in 1995 when the "Singles" compilation came out, but these repressings are identical to the 1993 editions, except for a yellow exclamation mark sticker on the front of the case marking them as half-price reissues. The front of the cd artwork features the compact disc logo in the top left corner as on the original Rough Trade UK cd, but the band's name is given an edge as in the USA. The back looks clearly more like the better looking UK design, but it features much more credits. For some reason, the lyrics inside the cd booklet are in a mixed order. The individual band members photos appear in black and white, and the additional Eric Watson band photo, which was originally only found in the original Rough Trade UK cd, is also featured. The disc surface is a very rich looking pinkish red. The album features bonus track "This Charming Man" which was included on many international editions of the album but not on the original Rough Trade UK LPs and compact discs. There are two slight variations of this item. Some copies say "France WE833" under the barcode on the back, others say "WE835". This is believed to be a price code. 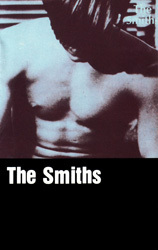 WEA followed the original Morrissey-designed artwork for the cassette format which had originally only been used by Rough Trade in the UK and Virgin in France. This is a relief because all other licensees in the 1980s had opted for cheaper looking and often quite plain designs based on the LP artwork. The insert is almost the same as the original UK insert, more particularly the variation (described for Rough Trade UK cassette above) with blue spine and back. The most notable difference with the original Rough Trade edition is the cassette itself which was produced in clear see-through plastic. WEA had something for collectors in their 1993 reissue programme as every album was also put out on numbered limited edition 10" sized LPs. The records were produced in very thick vinyl. The labels are of a very rich dark red, with silver grey text. The inner sleeve is a plain white one, which means that the photos and lyrics featured on the original inner sleeve are unfortunately not included. The outer sleeve shows the band's name in white on the front, and the stamped number in a box in the lower right corner. The back is similar to the original pressings, plus a bar code in the center and additional credits. Copies of this item have been spotted with a plain white promo sticker affixed to the back of the sleeve, but this is very likely not a legitimate promo. The French LP is a beautiful item, as well packaged as its UK counterpart. Its labels are quite nice, with maroon text on a rich grey background. The inner sleeve is made of thick paper, in the same colours as in the UK. The text on the back of the sleeve follows the same layout, with the Virgin logo added to the lower right corner. Post 1984 repressings of Smiths vinyl in France were given an alternate 5-digit catalogue number instead of the original 6-digit one. The only difference between the second edition and the first one is the correction of the catalogue number on the labels and on the back of the sleeve. EVerything else, including the typo "The Hand That Rocks The Gradle" on the record's label, remained the same. Further repressings in the late 1980s kept the same catalogue number, but the labels were changed for ones that were beige with black text, and some of the logos on the back were moved around. 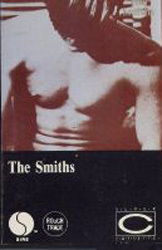 Virgin in France was the only international licencee to follow the Morrissey-designed artwork for the cassette format. In all other countries, labels had opted for cheaper looking and often quite plain designs based on the LP artwork. The insert is made of thick, glossy card. As in the UK, the front shows the left half of the original artwork, with the second half carrying over in grey tones inside the insert. The cassette itself is made of very light grey plastic, with blue text printed unto it. The typo "The Hand That Rocks The Gradle" is also found on this format, as on the French LP's label. 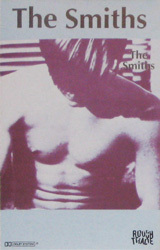 The cassette includes "This Charming Man", slotted at the end of side A. 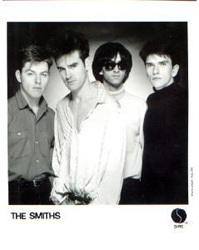 The cover photo on the French cd looks very grainy and dull, much like a bad scan, but the booklet is as nice as in the UK, and features the same additional photo of the Smiths by Eric Watson. The back artwork has the usual maroon background but the text there is white. The cd has plain black text on its top silver surface, in the same layout as in the UK. The only major difference there is the addition of the mandatory SACEM logo. Stock copies of the first LP edition above were made into promos by being stamped with the warning "Disque gratuit interdit a la vente", the words forming an embossed circle in a corner of the sleeve. Classic layout with band name on top, cursive Rough Trade logo on the left, and track listing at the bottom. Same layout as the promo described next, so most of the text is found at the left and bottom of the label. The Rough Trade logo is the rubber-stamp type, at top left, and the name of the band is in much smaller font and positioned to the left of the hole. A 2-sided folded press sheet showing on one side a big bouquet of flowers, a photo of the band (Morrissey with hands in the air in front of him) and a discography of the band's first three singles and the debut album, and on the other side a faded repeat of the same bouquet, with what looks like a bio printed over it. A collection of photocopies from music magazines such as the NME, totaling 10 page sides stapled together. The front page shows a photocopied press shot of the band by Paul Slattery (Morrissey with hand on heart) under the header "Pressespiegel". A 3-page "Biographie:The Smiths" featuring the same text as seen on the 2-sided folded press sheet described above. Two promotional postcards (view 1, view 2). The reverse sides advertise the debut album and the recently released "What Difference Does It Make?" single. The test pressing of the German LP bears plain white labels. Some copies are circulated in a white record bag while others come in a stock German picture sleeve. The Greek LP sleeve is quite similar to the UK one, with band name on front and titles on back in light grey. The back features the mandatory additional credits in Greek. 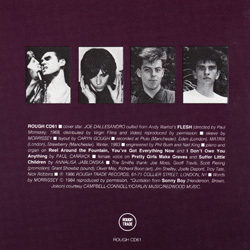 The record is slipped inside a plain plastic inner sleeve, and a two-sided paper insert shows both sides of the British inner sleeve, in the same colours. The labels are the classic Virgin ones, green on one side and red on the other. The Greek cassette front shows the LP artwork between white borders on top and bottom, with the band name and Virgin logo in black. The cassette itself is beige, and some copies have the titles printed on it in blue while others have them in green. The insert unfolds once for credits. The first of two different editions of the Dutch LP is very similar to the original UK pressing in typeset, but quite different in colour. The band name on the front is a shade of navy blue not found anywhere else except in Germany. The text on the back is dark lavender. The bottom left corner features the additional number 08-22837. The inner sleeve is charcoal grey with white text, a combination not found anywhere else. The photos on the picture side of it are grey instead of maroon. The labels are identical to the first UK version described above, but the colours are black text on white background, and the additional catalogue number 08-22837 is found under '33 1/3 RPM'. Some copies also have STEMRA written there, while others don't. Initial copies of the LP came with a bonus one-sided "This Charming Man" 7" (RTOS136/08-10803). These initial copies usually have a sticker on the sleeve stating "Limited edition with free single". The 7" is detailed separately (see below) because it is more often circulated on its own than with the album it originally came with. The LP was reprinted after Megadisc were properly licensed to release Rough Trade material in Benelux. The main difference between this new edition and the previous one are the labels which were changed to the classic Megadisc circular saw blade type. The inner sleeve here is not glossy like the earlier one was. The inner and outer sleeves look basically the same, the only change being the correction of the catalogue number. The bonus 7" which was included with initial copies of the original LP edition described above is slipped inside a plain white custom paper sleeve. Its a-side label is white with black printed text and features the cursive Rough Trade logo at the top. The label on the flipside, which doesn't feature any music, is similar but states "don't use this side". The Indonesian cassette is a very obvious unlicensed production in very amateur packaging. The front shows the artwork to the "This Charming Man" single, but ironically, as the tape was probably recorded from a UK LP, the latter song is not even featured on it. This is not for lack of space as two songs from The The's "Soul Mining" are tagged at the end of side B. The insert also shows the Rolling Stones' 'Lips' logo, but this is because it serves as the logo for the 'label', Specialist Recording. The cassette itself is a black BASF tape with green label, probably a C45 or C60. One for the completist only. Rough Trade in Italy did a reasonably nice job with the Smiths' debut album. The sleeve is nothing unusual visually. The band name on the front is mid-grey and the titles on the back are light grey. The back has the same layout as in the UK, plus the Virgin credits and logo. However the track listing there includes "This Charming Man" even though the song is not found on the album. The inner sleeve is of rather thick semi-glossy paper. The colours and layout are very similar to the UK LP's inner sleeve, with perhaps the grey coming out closer to tan on the lyrics side. The labels are tan with red text and the layout of the text on them is identical to the layout of the UK labels, with rubber-stamp Rough Trade logo on the left and Virgin logo on the right. 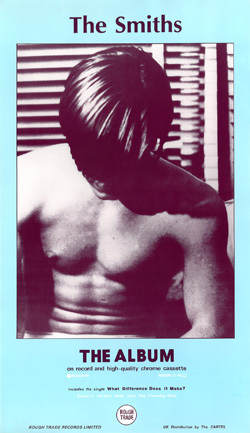 Virgin used their own cassette artwork design for the Italian edition of the Smiths debut on that format, and it hasn't aged well, except in the eyes of those who are into tacky 1980s esthetics lifted from 1984 editions of Smash Hits. As for most other Virgin Italia cassette releases in and around 1984, the LP artwork is found in the middle, surrounded with angular shapes and green and red scribbles. 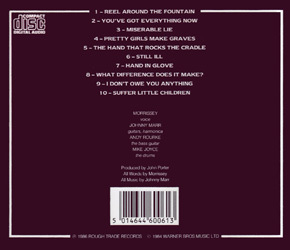 The insert is of the most basic type, not giving much more than the album's basic 10-song track listing (including the typo "Suffer Little Childrens"). There are two different variations of the cassette itself out there. One is beige with black text. The other is made of white plastic and bears blue labels with white text. Japanese releases are usually beautiful items and this one is no exception. There is no surprise with the front and back, the only changes are minor ones: the catalogue number in very small print in the top right corner on the front and Tokuma Japan credits are the very bottom on the back. The labels are beige with red text and feature the cursive Rough Trade logo. The record is slipped inside a top quality plastic inner sleeve. A trifold paper insert is also found inside the sleeve. It features on its various sides the artwork from the UK LP's inner sleeve, a bio, lyrics in Japanese, various band photos, a discography and a pink tinted version of Jean Marais as used on the cover of the "This Charming Man" single. The obi is lilac coloured and advertises recent Rough Trade releases on its back. It also announces a Rough Trade fair to be held between 25th March and 20th May 1984. There are actually two versions of the obi, as some feature a white circle with Japanese text at the top on the front side, and others don't. The text in that circle advertises the inclusion of a bonus interview flexi. This flexi is discussed separately (next) because some copies were also paired with promo editions of this album. Some copies of the original Tokuma LP (in stock or promo) came with a bonus red flexi featuring an interview of the band conducted in October 1983 at Strawberry Studios while recording the debut album. It comes in its own little clear plastic film sleeve. This item is what makes the Japanese debut LP a highlight of many fans collection. Following the release of "Strangeways, Here We Come" in 1987, Victor Musical Industries, who had meanwhile acquired the rights to release Rough Trade material in Japan, re-released the whole Smiths catalogue on LP and compact disc. The outer sleeve of the debut LP reissue remained the same except for the minor changes for label and catalogue number in the top right corner on the front and at the bottom on the back. The obi announces Victor's reissue programme as "The Smiths Final Collection" and advertises all the albums being released on its back. The record has a rather plain grey pattern on the labels with the Rough Trade logo appearing in a circle at the top. It is slipped in a plastic film sleeve with round bottom. Two inserts are also found inside: one features the lyrics in English and the other the lyrics in Japanese, with a bio. This is the first of only four cassettes to have been produced in Japan (for the Smiths), and the only one released by Tokuma Japan. It is a very beautiful item, even to those collectors who are not generally interested in this format. The insert is the type that wraps itself around the cassette. The front shows the LP artwork inside a white background, with the band's name in red at the top in the same font used on the album. One spine is white with release information in English, in grey and red. The other spine is beige-grey and shows the same information, but in Japanese. The back on the English side is white, it features a track listing in red and credits in black. 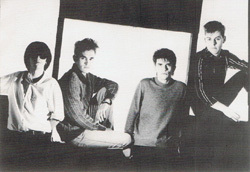 The back on the Japanese side shows a photo of the band over a beige-grey background, above light blue credits. Two inserts are found inside, both large white sheets folded many times in order to fit inside the case. These inserts feature the usual bio, lyrics, photos, etc. The cassette itself is white with aqua and black labels. This is one of the few licensed cassette editions of this album not to feature "This Charming Man" as bonus track. The first of six cd pressings of the debut album (not counting the 2-cd set with "Meat Is Murder" discussed in the section detailing multi-title sets) is arguably the most exciting, possibly because it was the first ever cd released for the Smiths (in September 1984), but also because of its unique track listing featuring four bonus tracks. The front artwork is the same as the LP's, but with a compact disc logo added to the top left corner. The back layout is similar to the UK one, but it is much more busy, with all 14 song titles listed both in English and Japanese, additional credits and many logos. 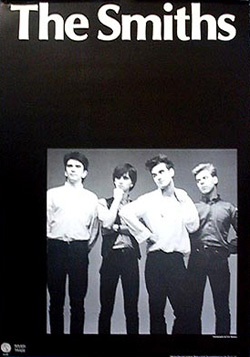 The booklet includes a short biography of the band, the usual lyrics, plus lyrics for the bonus tracks "This Charming Man" and "Heaven Know I'm Miserable Now" in a different font because they were reproduced the way they appear on the back covers of their respective 12" singles. The booklet also includes the photo of the Smiths by Eric Watson first seen inside the Japanese "This Charming Man" 12" and the later UK/France/etc. cd editions of this album. The individual band member photos are found in black and white on the back of it. This first edition was not sold wrapped in an obi but it had a lilac coloured round sticker fixed to the front giving the band's name, the catalogue number, the price and the incentives (in Japanese) "Intelligent music In England For The Moment" and "#1 on indie chart". 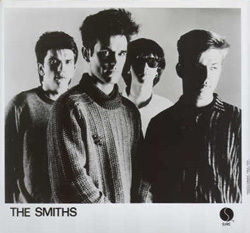 Following the release of "Strangeways, Here We Come" in 1987, Victor Musical Industries, who had meanwhile acquired the rights to release Rough Trade material in Japan, re-released the complete Smiths album catalogue on LP (see above) and compact disc. This new cd edition was not as beautiful as the first one. For some reason the front artwork was slightly cropped and given a blueish tint. The catalogue number was added to the bottom left corner and the compact disc logo was dropped. The bonus tracks were dropped so the back of the cd and the back of the booklet show the regular 10-song track listing in the usual layout. The back of the cd also adds a barcode and a black obi-like stripe at the right giving release information. The obi itself is a very unappealing peach-beige one with minimal information on it. The booklet features the mandatory bio, lyrics in English and Japanese, plus a Rough Trade - Victor discography, but no photo. The cd itself has plain black text. The cd tray is made of white plastic. In 1990 Victor went through another reissue programme (the "Meet The Rock" budget series at 2000 yens), but this time the Smiths album back catalogue was re-released on compact disc only. The packaging of this edition is very similar to that of the 1987 edition. The booklet is the same while the label, front and back are identical except for the corrected catalogue number. Only the obi was changed to the common blue and yellow theme of this "Meet The Rock" series. The cd tray is made of white plastic. 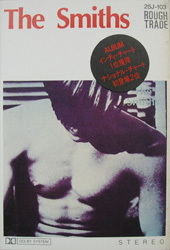 This new Japanese edition was released by WEA who had just purchased the rights to the complete Smiths catalogue the year before. Its packaging is superior to that of the earlier Victor reissues but the unlike the latter editions, this one features "This Charming Man" as bonus track. It was modelled on its European counterpart. The compact disc logo is back on the front, as on the original Tokuma Japan cd. The disc surface is of a beautiful rich red colour like the European cd, with the same layout but with extra credits. The obi is light blue-green and beige with a blue "Smiths Original Catalogue" crest common to all re-releases in the series. 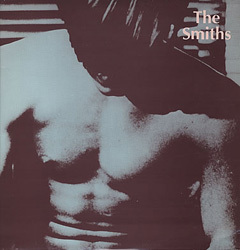 Its back covers the complete backspace and displays over a beige background "The Smiths Original Catalogue", an illustrated list of the eight albums being reissued by WEA. The booklet is the same as the European WEA one described above, but with the Japanese catalogue number on the rear page. The package also includes a single-sided square piece of paper with Japanese writing on it and a folded doubled-sided four page booklet including a bio and lyrics in Japanese. The cd tray is made of white plastic. In parallel to the release of the "Singles" compilation, another reissue programme of the Smiths back catalogue was put together by WEA in Japan. This 1995 budget reissue of the debut album is very similar to the one from just 2 years prior. The most noticeable changes were the white and yellow obi with red ignited 'Hot price!' bomb common to all the releases in the series, and an additional "Smiths Original Catalogue" insert inside. The cd tray is still made of white plastic. The most recent reissue programme of Smiths material in Japan dates back to 2006 when all the albums were re-released in mini-replicas of the original LP sleeves. These are slightly bigger than the typical size of a compact disc. In the case of the debut album, the original UK LP pressing served as a model for everything with the exception of the obi which was based on the original Tokuma LP obi (the variation with white circle detailed above). The labels are tan with red text as in the UK instead of beige with red text as was the case in Japan. The text layout on them is similar to both label layouts because the original Japanese labels were already modelled on the British ones. The inner sleeve of the cd is a quasi-perfect replica of the original UK LP one (without the lyrics to "This Charming Man") because the original Japanese LP was slipped inside a plastic film inner sleeve. This 2006 cd is actually also slipped inside a plastic film inner sleeve (the round bottom variety), which is in turn slipped inside the picture inner sleeve. The back of the outer sleeve is very minimal, closer in appearance to the original UK back than the more busy Japanese one which featured a lot of Japanese text and logos. It doesn't mention the inclusion of bonus track "This Charming Man". The latter song is only credited on the labels and in the additional white paper booklet which features the lyrics in English and Japanese and what looks like a bio. This is a bootleg compact disc. The American edition of the cd was packaged with a black obi with Japanese text to make it look like a Japanese import. The obi doesn't mention any record label. The promotional version of the original Tokuma LP is identical to the stock one, but with two exceptions: it has the usual 3-character promo text at the right side on the label, and a white 'SAMPLE NOT FOR SALE' sticker in the top right corner of the front of the sleeve. The obi is the variant that features additional text in a white circle because it came with a bonus flexi 7" (described above). Victor's 1990 reissue programme was promoted with copies of the albums (including this one) with "sample" stamped around the center of the cd and a promo sticker on the obi. Promo copies of this edition do exist. Information needed. Promo versions of this edition of the band's debut album are stock copies with an additional white sticker with red text affixed to the back of the obi and 'sample loaned' etched on the cd's inner ring. The New Zealand LP is slipped inside an Australian sleeve (see description above), so it may therefore be mistaken for an Australian release if one does not look inside. The name of the band on the front is very dark green and the titles on the back are pale green. The record inside looks nothing like its Australian counterpart as its labels are green and red silhouette ones typical of New Zealand and later Australian releases. The record is expected to be slipped in a variation on the usual picture inner sleeve, but this needs to be confirmed. The existence of copies on which "This Charming Man" is slotted at the beginning of side 2 and "Still Ill" at the end of that side has been reported, but this is unconfirmed. The front of the New Zealand cassette is exactly the same as the front of the Australian cassette (view left). In fact, the former is usually mistaken for the latter as they bear the same catalogue number and nowhere on the packaging of the former edition is it mentioned that it comes from New Zealand (like most New Zealand editions it is recognizable as such by the absence of "Made in Australia" on the packaging). The spine and back flap are also the same as in Australia, the spine white with "The Smiths" in the middle in big bold red letters, the catalogue number in pink on the left (above a Dolby logo) and a black 'shattered' Rough Trade logo on the right; the back flap featuring only the track listing and a block of Rough Trade credits in black over white. A big difference between the packaging of this edition and its Australian counterpart is the presence of an extra fold-out panel on the insert. It is white with black text and features the track listing, a production credit, a block of small text including reproduction warning and Dolby information, and a Rough Trade credit. The cassette is pale grey and bears white paper labels with black text. 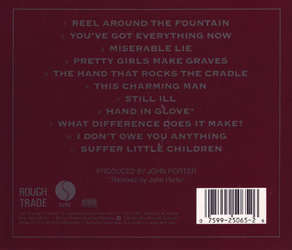 The track listing appears at the top on each side, with the catalogue number in the top left corner and a 'shattered' Rough Trade logo on the left. There are no surprises with this edition's outside sleeve. The name of the band on the front is silvery grey. The rear is as in the UK, perhaps slightly darker, and features additional logos. The labels are white with black text and a 'Pari Member Approved' stamp. The record is slipped in a simple anti-static sleeve, so the lyrics and the usual inner sleeve credits are not included. The Philippines cassette looks like an unlicensed edition, and it may very well be one. The insert is dark pink, the text font is quite dull, and the front features a blue tinted reproduction of the LP artwork. The track listing appears on it at three different places: the front under the artwork, the back, and inside once unfolded. It is the basic 10-song track listing. The cassette is made of smoky clear plastic and its labels are light blue with black text. This is one of only two official Smiths releases to have come out of Poland. It appears to be a legitimate release, unlike the numerous flexi singles that came out of that country. The sleeve is darker than the UK one, it is almost darker than the back. The band name on the front is grey. There are two variations of the back of the sleeve: on some copies the text is white and on others it is golden beige. The inner sleeve looks like the British one, but it was produced in a cheaper paper. The labels are red with black text. The Portuguese debut LP has been noticed by collectors because the band's name on the front is coloured pink. The maroon on the back came out brown and the text there is white. Additional Transmedia credits are found at the top. The record is slipped inside the usual inner sleeve featuring lyrics on one side. The labels are yellowish beige with pink letters, although copies with grey labels (also with pink letters) may perhaps also be found. The pink vinyl, blue vinyl, yellow vinyl, red vinyl and clear vinyl LP editions on Rough Trade/Transmedia are actually bootleg reproductions made in 2006, 2007 or 2009. 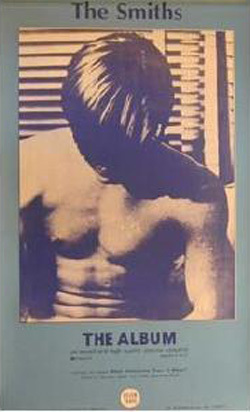 The front of this unlicensed edition features a unique cropping of the Dallesandro head and chest from the LP artwork, with "The Smiths" in green over its middle and a red and white CS logo in the bottom left corner above white catalogue number, etc. The track listing is printed inside in black and white. The cassette is grey with white, red and blue paper labels. This unlicensed cassette features the basic 10-song track listing. The front shows the LP artwork in black and white, over a baby blue and pink background. The tape is made of beige plastic and has the titles printed straight onto it, in black. Nowhere on the insert or the cassette is there any information about the country of release. This unlicensed cassette has to be the funniest one to collect. The artwork on the front was probably deemed too indecent, so cover star Dallesandro was 'dressed' with drawings of buttons, denim lapels and pockets on his chest, and to the unknowing eye, he does look here like he is wearing a shirt. The track listing is the basic 10-song one, but the order was messed up and 4 songs by Cabaret Voltaire were tagged at the end of side A and at the beginning of side B. The cassette itself is tan coloured with black text and blue logo. This unlicensed cassette's insert features the LP's artwork on the front over a white background with the band name appearing in fuschia. The cassette itself is beige and the labels are white with black text. It features the basic 10-song track listing without any bonus. The colour of the front artwork of this edition is ash pink and the band's name appears in tan, almost gold. The record is slipped inside a white paper sleeve instead of the picture one, but the usual inner sleeve artwork is reproduced on a two-sided paper insert also found inside. The text layout on the labels is close to that of the UK LP. They feature the 'shattered' Rough Trade logo as well as the weird Nuevos Medios one. There are two variations of these labels out there. The most common are beige with pink text, very reminiscent of the labels on the Portuguese pressing, while others are white with black text. Information about this item is needed. The Swedish LP, like most other Swedish releases, is very similar to its UK counterpart and is regularly being mistaken as a UK pressing by non-collectors, in part because it was given the same catalogue number as in the UK. The front photo is in the same tint, but the band's name is darker grey and stands out more. The back of the sleeve is absolutely identical to the UK's except for the MNW logo in the lower right corner. The inner sleeve's photos and lyrics are found in black and white instead of the UK combination of maroon over grey. The labels are typeset like the British ones, but their colour is a very rich, deep red. Some copies served unofficial promo purposes by being sent around with a MNW promo postcard. The Taiwanese cassette is almost certainly an unlicensed edition, but it was still produced with much more care and attention than your average unlicensed cassette. The front of the insert shows the usual LP artwork over a white background, under band name and title in an unrelated black script font, and above a black portion with Chinese or Taiwanese text. It wraps itself around the cassette, so one spine displays the information in English while the other displays it in Chinese or Taiwanese. The back shows a track listing and photos of the band members, in colour. An additional paper insert features lyrics, a brief album discography, and some additional text which could be a bio or an interview excerpt with Morrissey. The cassette itself is black with a yellow label. It features the basic 10-song track listing. The band's name on the front cover of the American LP is grey and the letters were given an edge to make them stand out more clearly from the background. The text on the back of the sleeve is dark grey. The inner sleeve is the same as in the UK, but it is in black and white instead of maroon on grey. The lyrics to the bonus track "This Charming Man" are added at the bottom of the lyrics side. The labels are the classic yellow Sire ones, but there are two versions of them in circulation, differing only by the Sire logo: on some copies the word SIRE is found at 2 o'clock around the logo, while on others it is found at 6 o'clock (so beneath it). The front of the 2009 Rhino LP reissue is the same as the original UK Rough Trade LP, with the band's name appearing in grey. A black, white and red sticker on the front advertises that the remastering was conducted by Johnny Marr. Information about the rest of this item and how it differs to its UK counterpart is needed. The American cassette is not the highlight of anyone's collection. The front shows the LP artwork, but the letters of the band's name are not as visible as on the latter format, which doesn't really matter because it is repeated underneath on the black background. The insert is very basic, it doesn't unfold and the credits are simply printed on its reverse. The tape is white with black text. This is identical to the version sold in stores, with minor credit adjustements for Columbia House instead of Sire. There are three different American compact disc editions of the debut album, not counting the record club editions listed next. All feature the USA LP artwork on the front. This means that the letters of the band name have that edge making them more visible, but also that the front does not feature the compact disc logo on it like in the UK and many other countries. All seem to have the same booklet (confirmation about this would be appreciated) which features the credits and lyrics as well as the usual individual band member photos in black and white. The labels have the same typeset, although one edition has additional text (see below). In all cases the back shows the titles in much bigger letters than anywhere else (bar Canada because Sire Canada models its releases on those of Sire USA). The order in which the three versions are described below reflects the most likely production order. This is the most likely original edition. The back features a paragraph explaining compact disc technology and the Sire logo is found on the right side above the barcode. The disc differs from the next two versions by the presence of the line "Made in USA by DADC" at the bottom, the number DIDX 2967 above the Sire catalogue number, and the absence of the line "Mfg by WEA Manufacturing" in the credits on the left. The back is as above. The line "Made in USA by DADC" at the bottom of the disc surface and the number DIDX 2967 above the Sire catalogue number are dropped and "Mfg by WEA Manufacturing" is added to the credits on the left. On the back, the Sire logo is moved to the right of the Rough Trade one on the left, and the compact disc technology paragraph is dropped. The disc is identical to standard version 1 above. This alternate record club edition shows the usual cd artwork on the front. The back is modelled after those of the DADC retail edition and standard edition version 1 (see above for stock cd variations) but the barcode was removed, the catalogue number was changed for the Columbia House one and a Columbia House manufacturing credit was added beneath the other credits. The spines are the same as those of the retail editions except for the catalogue number. The booklet is also the same as the one inside the standard retail editions, but the catalogue number in the top left corner on the back was changed for the Columbia House one. The disc differs only from those inside the two standard editions above by the correction of the catalogue number. This alternate record club edition shows the usual cd artwork on the front. The back is modelled after those of the DADC retail edition and standard edition version 1 (see above for stock cd variations) but the barcode was removed and in its white box are found the BMG Direct catalogue number and address. The spines were left unchanged. The booklet is the same as the one inside the standard retail editions, but the BMG Direct catalogue number was added in black in the top right corner on its back. Similarly, a BMG Direct manufacturing credits and their catalogue number were added on the left side of the disc surface beneath the usual block of credits. Until about 1992-1993, compact discs were sold in the USA in tall picture boxes. Many were destroyed after purchase, but some were salvaged and ended up in fans collections. These boxes featured their own variation/cropping of the album's artwork. In the case of the Smiths' debut album, the front artwork shows the middle portion of the usual Dallesandro cover, cropped to show only the head and the center of the chest. The back is just like the LP back, all maroon with titles and credits in grey. View front and back. The spines are maroon with release information in grey. The promo edition of the American LP is a stock one with a promo warning stamped in gold ink on the front of the sleeve. 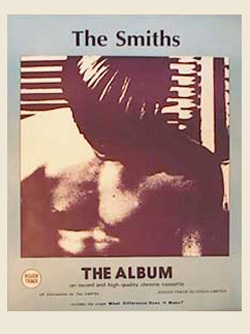 The blue wing-shaped sticker giving the catalogue number and stating that the album features the songs "This Charming Man", "What Difference Does It Make?" and "Reel Around The Fountain" which was usually found on the stock LP's wrapper was affixed directly onto the sleeve of the promo (because promos were never sealed). The version of the Sire logo found on the labels of the promo records is the variant that features the label's name at 2 o'clock (view stock LP above for information about these logo variations). A 12" sampler featuring the songs "What Difference Does It Make? 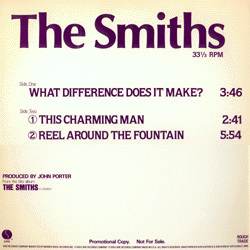 ", "This Charming Man" and "Reel Around The Fountain" was also pressed and distributed to promote the album. The sleeve is beige (actually more like white having been exposed to cigarette smoke for too long) with track listing promo warning and credits appearing in maroon on the front. The labels are the classic yellow Sire ones. A 2-page press release on yellow Sire paper was sent to media, either with the promo LP or the promo 12" detailed above. Most copies of this item are now circulated apart from the record they were originally slipped in. This has been seen paired with a 12-page collection of photocopied media clippings, taken from NME, various issues of Melody Maker and the Sunday Times Magazine, or with one or two Sire black and white press photos of the band. Both of these photos are credited to Paul Cox (view here; view here). When not split up, these items are housed in a yellow Sire folder. A 1-sided 30cm x 30cm (12" x 12") promo card flat promoting the American release of the debut album. 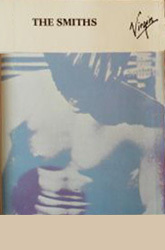 This item shows the usual album front artwork cropped to fit the postcard's portrait shape (view). The rear has brief details about the album and the "What Difference Does It Make?" single, with Sire and Rough Trade logos. The release of this album was also more limitedly promoted in the USA with the help of a cassette which surely served advance promotional purposes. The insert is a generic Warner Bros one. The front has a typewritten track listing and printed "Warner Bros Records", as well as a Dolby logo. The spine has "The Smiths" and the catalogue number, typewritten. The telephone number for WEA Manufacturing is found on the back. The cassette is made of clear plastic. It has silver paper labels with generic printed WEA Manufacturing info as well as "The Smiths" and "WB-25065" in typewriting at the top. The case is all made of clear plastic. This might be the most unusual item to collect for this title. The front of the sleeve shows the usual artwork, but the band's name appears in yellow. The back of the sleeve is a reproduction of the lyrics side of the usual inner sleeve. The record is slipped inside a plain white paper sleeve. The labels are white with red text, featuring a huge Plum Records logo. A LP edition of unknown origin has made it into the hands of a few collectors. It looks very much like a UK LP on the back, but the front of the sleeve shows the band's name in a very unusual orange. The construction of the sleeve is also quite unusual. It is made like American LPs were made in the 1960s/70s, with two card boards covered in a printed paper 'slick' which is stuck onto the front and back. The labels are blue with black text, identical to the German black vinyl labels, but the Rough Trade logo is the rubber-stamp one and the GEMA and LC logos are absent. The record is slipped inside a plastic anti-static sleeve and both sides of the UK's inner sleeve are printed on an insert. This item may have served early promotional purpose, although there is also reason to speculate that it was produced in Hong Kong. Little is known about this unlicensed item. The front shows a peach tinted reproduction of the LP artwork with '1984' in neon font over it. The picture is set over a white background also featuring the band's name in peach colour. The cassette itself is black with white/pink/red/black labels. The track listing seems to be the basic 10-song one.